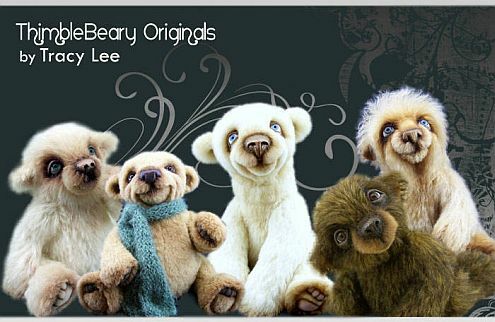 As the waters rose in the flooded areas of Iowa, Tracy Lee of ThimbleBeary Originals remained safe from the devastating flooding. "We are in fact okay, and are very fortunate to live in the tiny portion of Iowa that has not been declared a disaster area. All we had to suffer with was a few inches of water in the basement and in the barn from run off and the high water table coming up in the drains. Not so hard to deal with in the entire scope of things." This proved very fortunate not only for Tracy and her family, husband Darren and sons Zach and Nathan, but also for the menagerie of animals sharing their home. Living on a small acreage in rural Iowa, Tracy's family have lots of room for pets. "We have two Arabian mares, twenty fat and happy barn kittens, two Indian Blue peacocks, our three dogs, four spoiled house cats, two cockatiels, a hamster, a guinea pig and a Bourbon Red turkey who lives in the chicken house with two dozen chickens!" Energetic Tracy finds time to care for them all, read and work in her flower garden and of course, there is time for her bear-making activities. 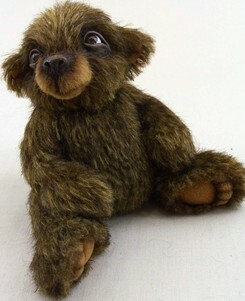 Tracy started her bear making and soft sculpture creations about 3 years ago. "My first bears were gifts for my family, but I quickly became hooked." Although she always considered herself a "craft" person, most of the interest would fade and she would move on to something else. For some reason, bear making stuck with her and she's been deeply involved with it every since. "I was like a sponge soaking up all I could," she said excitedly, "I had so many ideas in my head and needed to learn how to bring these things about." Inspired by an artist's book and by the information she gained in online forums, she took her creating to a level she had only dreamed about. 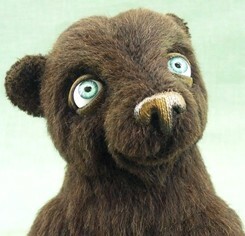 "Each bear I've made since is a learning experience. There are so many techniques to master, so many creations waiting to be born, and with the challenge of creating new looks with new methods, it never gets boring." 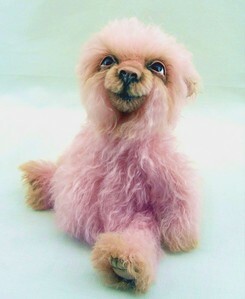 Making her creations from mohair, plush and sometimes recycled natural furs, her pieces range in size from tiny miniatures to large huggables. 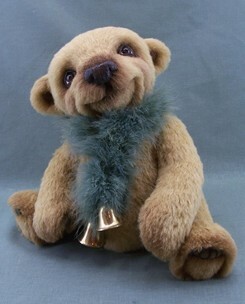 With distinctive and whimsically realistic appearances, Tracy works diligently to make sure that their expressive faces pull at your heartstrings. 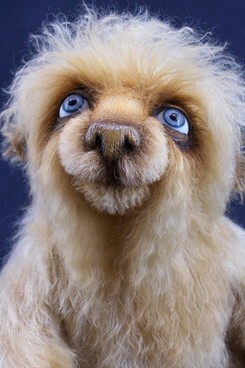 "An endearing expression is important to me, so I utilize extensive needle and scissor sculpting to achieve this." 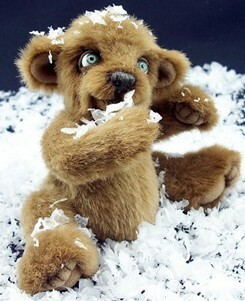 Excellence in quality, workmanship and personality in each bear also is very important to her. 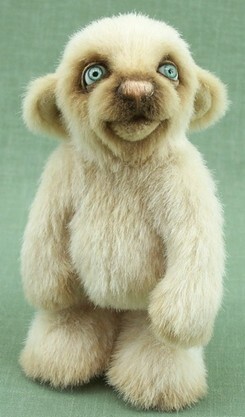 "I am a bit of a perfectionist and perhaps this is one of the reasons my bears take so long to finish." Averaging 25-30 bears each year, the added details are very time consuming. The shading alone can take hours depending on the size of the bear. 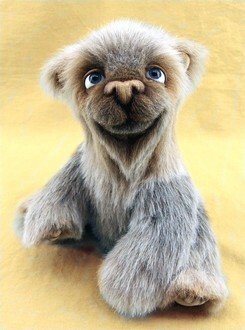 Always on the lookout to expand her techniques, Tracy is now sculpting designs in clay and using a pattern draping method to recreate bears in mohair. "These will be the next, brand new designs to come out soon and I am very excited about them." Tracy finds the internet a great way to be everywhere but still at home. 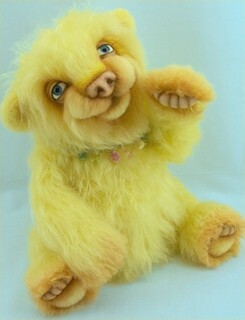 Her bears are available at online auctions, at online bear shows and sold directly from her web site. "I am fortunate to be able to work at home so that I'm always here for my family and I'm working at something that I absolutely love." And if her bears have anything to say about it, you will know exactly how she feels when you look into their loving and dreamy eyes.